Okay. 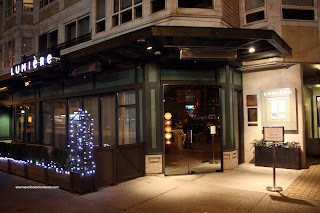 If you haven't noticed by now, I've been trying to sample the very best meals in Vancouver. Of course "the best" does not necessarily mean the "most expensive". Case in point, the chicken wings at Phnom Penh. Yet, how do we know if something, that is deemed expensive, is good or not? Simple, go try it out. Naturally, that is not an economically sound endevour by any means. The kids don't need a college fund, right??? So, from the Omakase at Tojo's and Octopus' Garden, the seafood tower at Blue Water, the porterhouse at Gotham, local celebrity chef's restaurants Bishop's and Cioppino's, the tasting menus at Market and La Belle Auberge to the best French food in my opinion, Le Crocodile, I am working my way through. Next up is a place I've been eying for quite awhile. Lumière. 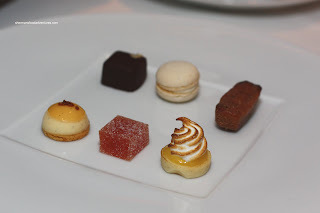 The tasting menu at Lumière was one of the best in Vancouver prior to Daniel Boulud's arrival. Tonight, our goal was to see if their Grand Tasting menu would live up to the lofty expectations of a $175.00 per person meal. There are 3 tasting menus at Lumière with the Grand Tasting a the most expensive. Although it is advertised as a 9 course meal, the courses alternate amongst 2 people. Hence, there are actually more than 9 courses to "sample". As long as you have a cooperative dining partner who wants to share that is. 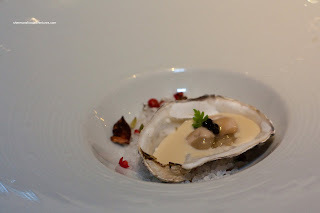 As an amuse bouche, we were presented with a Mini-Pacific Oyster with lemongrass veloute topped with sturgeon caviar. This small little bite packed quite the punch with a sweet oyster enveloped by a very apparent lemongrass kick. A nice little start to an epic meal. As our first courses arrived, I started with a Fraser Valley Venison Pâté with a consume gelée, cranberry, cauliflower and Orléans grainy mustard. The pâté was quite firm from all the large pieces of meat. In this respect, it was more like a terrine. I actually liked this since there was texture and it was quite apparent what I was putting in my mouth rather than the more finely chopped type of pâté. I found the flavour to be quite mild and not gamey at all. The condiments provided some nice sweetness and zing. 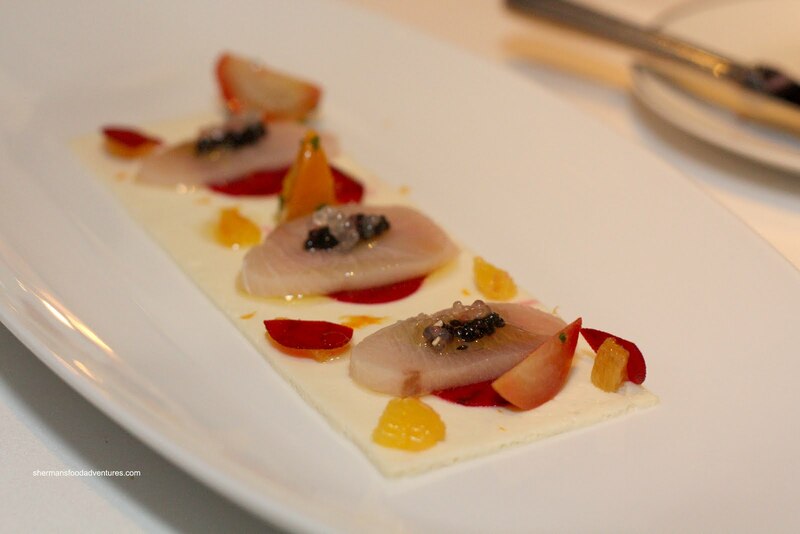 While I was enjoying my venison, Whipping Girl was working on the Citrus Cured Hamachi with finger lime, tofu, beets and white sturgeon caviar. I really enjoyed this one due to the sweetness of the hamachi paired with the acid from the citrus. The tofu didn't add much for me and was a bit clumsy to eat. The beets were a nice addition to an otherwise soft textured dish. 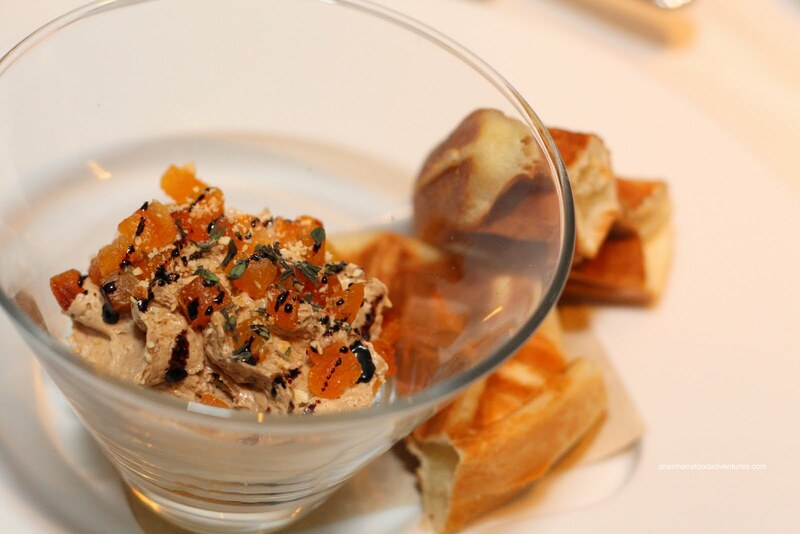 Moving onto another soft textured dish was the Quebec Foie Gras Mousse with celery root, apricot, hazelnut and brioche "waffle". Foie can generally be quite heavy since it is essentially pure fat. Much like the puffed foie gras at The Apron, the foie mousse had an almost non-foie quality to it. This is not necessarily a bad thing though. It still had the good elements of foie, in terms of taste, buttery smooth texture and melt-in-you-mouth decadency. 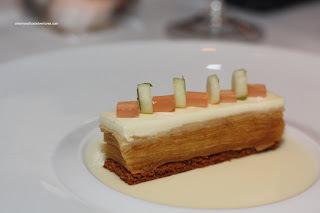 Yet it was presented as a "sundae" of sorts where underneath lay unsweetened apricot gelée and pureed celery root. The red wine reduction along with the apricots helped cut the richness of the foie. 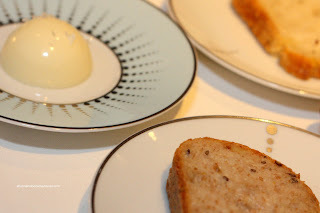 The hazelnuts were a pleasant surprise since I wasn't exactly sure if it would interfere with the smoothness of the foie. In fact, the crunch was welcomed as with the nuttiness. And the fact I'm a sucker for brioche made the accompanying "waffles" a treat to eat. 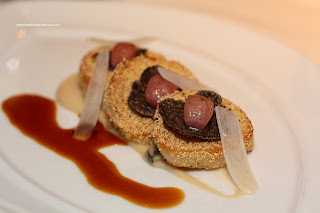 From the foie, we went back to the alternating courses with Whipping Girl starting with the Cornmeal Crusted Qualicum Bay Scallops with white beans, black truffle and icicle radish. Although the cornmeal crust gave a nice crunch to the scallops, I personally would've been happy with a plain sear. Naturally, the black truffles provided a strong earthiness to the dish. So much so that Pomegranate thought it tasted like the ground. Not in a bad way of course, it just did what black truffles do. 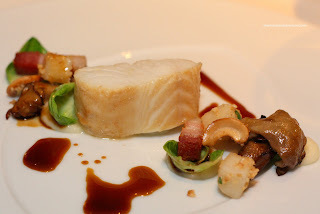 All along while Whipping Girl was enjoying the scallops, she was eying what I had - Four Spice Marinated BC Black Cod with smoked hen of the woods, pear, cashews, pork rillon and 5 spice pork jus. She was eying it because we were raving about it. The slow- baked black cod was outstanding. Texturally, it was moist and soft while still being flaky at the same time. Everything on the plate screamed out balance from the sweet pears, mild bacon, mushrooms to the cashews. Celery Root and Pine Nut Crusted Arctic Char with braised red cabbage purée, celery root spaghettini and black trumpets finished with a red wine sauce. Nothing wrong with that right? Let's just say the dish I was served would be the highlight of the night. More on that later... As for the char, it was very moist, maybe a little too moist. Not mushy by any means; yet it lacked some texture. It could've been a bit firmer in our opinion. I personally loved the trumpets underneath the char, a really woodsy taste that was necessary for the mild tasting fish. The whimsical celery root spaghettini along with more celery root and celery gave a nice textural balance to the other soft elements. But whatever really... Because the Three Squash Spiced Ravioli with brussels sprouts, king oyster mushroom and sage brown butter emulsion commanded our full attention. This was an absolutely OMFG dish. One bite into the slightly past al dente pasta yielded a flavour explosion of squash that I would have never imagined. Being a meatarian, I am not easily impressed by non-meat dishes. However, the squash was a delicious combination of natural sweetness, impactful savouriness finished with a smooth, buttery sweet creaminess that yelled out "heaven". If we thought nothing could top the ravioli, we were all presented with the Spice Glazed Fraser Valley Duck with Du Puy lentils, beet and apple carpaccio finished with apple duck jus. Normally, I'm not a huge fan of unrendered duck skin. However, the skin was so tasty due to the bold glaze, I had to eat it all. The glaze started off with a pronounced saltiness while finishing off with a sweet kick. That was all the tender duck needed to complete the flavour profile. Mind you, the tartness of the apples were a natural compliment to the saltiness. The luxurious duck jus only helped amp up the flavour quotient. What came next were the "meat" dishes. I had the Roasted Rack of Opal Valley Lamb with artichokes, onion, eggplant and lamb jus. Served without the "rack", the lamb was cooked beautifully and evenly. Whipping Girl thought it wasn't gamy at all. The lamb jus, much like all the sauces we had, was luxurious and had depth without being salty. The fried shallots on top looked like a garnish; but it added a lot to the overall flavour profile of the rare lamb. 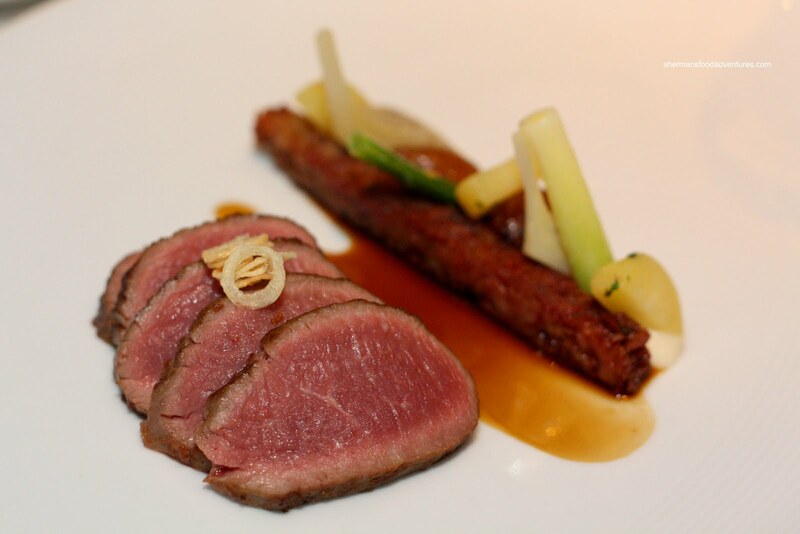 The lamb shoulder was formed into a "stick" which was much gamier and acted as a nice contrast to the rare lamb. 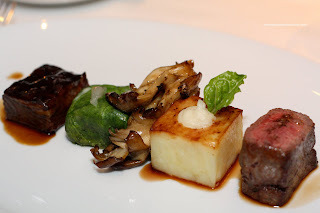 On the other side of the ledger, Whipping Girl started with the a stunning Duo of AAA Prime Beef consisting of a red wine braised short rib, seared rib eye, potato fondant and romaine parcel. First off, the braised short rib was sinful. Atop the tender rich meat resided a gelatinous layer of fat. Coupled with the concentrated Bourdalaise sauce, the piece of meat was a party in my mouth. As for the rib eye, it was very tender and properly seasoned. It was cooked perfectly medium-rare. I loved the potato fondant. It shows remarkable skill to cook a potato to the point of almost melting; yet at the same time retaining its structure and texture. The burnt milk & shallot made the potato extra enjoyable to eat. Although the romaine parcel wrapped in butter lettuce was a neat item, it was just lettuce to me. By now, we were not really in the mood for more food when all of a sudden a considerable Cheese Plate arrived (along with some fig bread and crackers), consisting of Fourme d'Ambert (cow's milk, Auverne, France), Quince Jelly, Candied Almonds, Comté (cow's milk, Franche-Compté, France), Manchego (sheep's milk, La Mancha, Spain), Le Chevrot (goat`s milk, Poitou, France) and La Sauvagine (cow`s milk, Quebec). 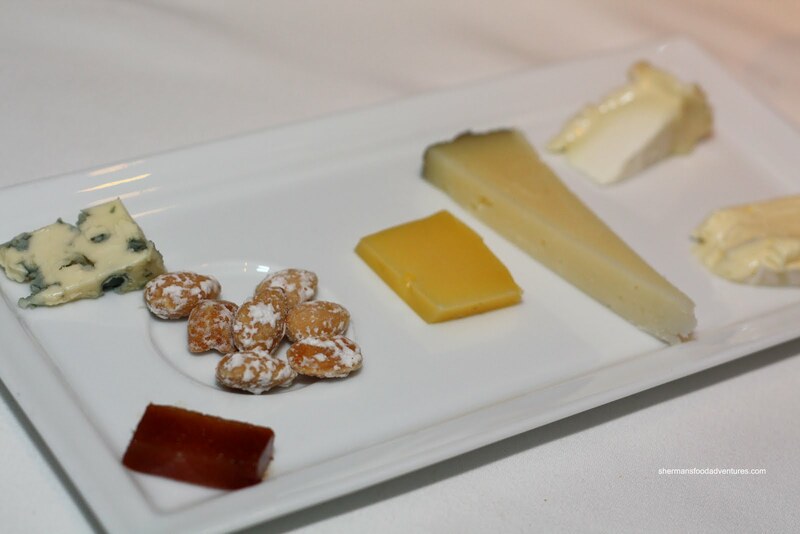 The sweet quince was a natural compliment to the gamy Manchego and blue cheese (Fourme d'Ambert). 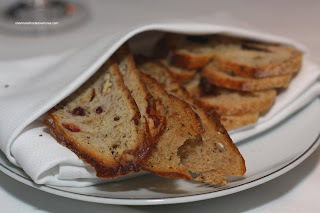 I really enjoyed the triple cream brie (La Sauvagine) with the fig bread. We didn't end up finishing all the cheese since we had to save room for dessert(s). The first one was the Pink Lady Apple Pavé on a speculoos crust with a ginger cinnamon panna cotta on top and bottom. The dessert was thankfully quite light and not too sweet. I found that the apple had quite a profound impact in terms of flavour. The mild panna cotta ended up as a textural compliment to the crunchy speculoos. The small pink lady squares combined with the small rounds of tart apple added another level of tart and sweetness. Our second dessert consisted of a Hot and Cold Tiramisu Sundae with chocolate cremeux, marscapone mousse, ladyfingers and coffee ice cream. The hot chocolate cremeux was served table side and poured over the sundae, melting the top piece of chocolate accented with edible gold. This was both a decadent and not very heavy dessert all at the same time. I know this doesn't make much sense. True, it was rich with all the chocolate, ice cream and marscapone; yet at the same time, I didn't feel overwhelmed. 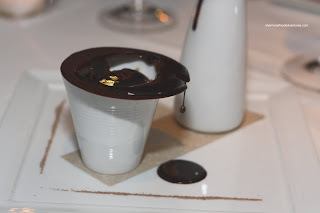 Rather than being incredibly sweet, the individual components provided a nice coffee and dark chocolate kick. As if all this wasn't enough, we were presented a small plate of Petit Fours consisting of chocolate, macaron, caramel, jelly and meringue. 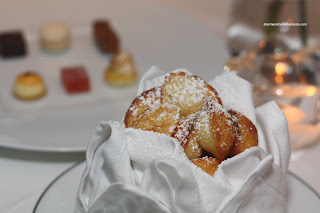 And finally, our last little treat was a basket of Madeleines right out of the oven. Wow. That's all I can think of to describe this meal. As much as I thought that this tasting menu would be hard-pressed to live up to the $175.00 price tag, it ultimately succeeded. The one thing that impressed me the most was the level of execution with every dish considering the quantity of items and the restaurant was practically full. As much as we demand perfection, it is really hard to attain. Another achievement was the balance of flavours. Not at any time was there an overpowering element to any dish. If it was on the plate, there was a reason for it. Naturally, not all of the offerings necessarily wowed us and honestly, that should never be the case since we all have individual preferences. But if we take everything as a whole, including the phenomenal service we received, it is no wonder that Lumière has just recently been awarded the 5 diamond rating from AAA/CAA for 2011. They now hold the distinction as the only restaurant in British Columbia to be held in such high esteem. I must mention that the service was highly professional and spot on. Yet, it was never stuffy or pretentious. I felt comfortable being myself and that in itself is very important to me. What's worse than feeling uptight during dinner? Of course not everyone can justify spending over $200 on dinner for one person; but if you can, do it at Lumière. omg you went to Lumiere! *dies*. so jealous. Quite the meal Sherman. I was drooling over your tweets as you ate. silf, yes believe it or not, I think we got our money's worth! Thanks for the kind comments! degan, it was to die for... Lucky me! Chris, it was quite a meal. It's been one after another. I'm one lucky guy... I still have to try the Hardware Grill in Edmonton! Keep hearing good things! Whipping Girl? Now that is an interesting name. 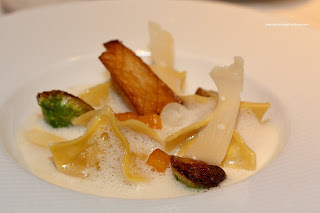 Great review of Lumiere. Thanks for the kind comments shokutsu! Great post and photos! 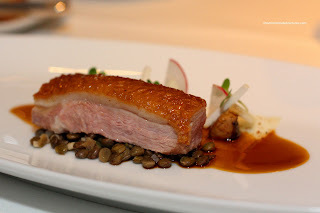 If I had an extra $200 I would most definitely go back and eat at Lumiere! 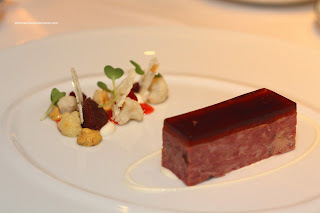 I have also tried the tasting menu, and also been lucky enough to have Dale MacKay, the executive chef, cook some excellent meals for me on other occasions as well. He is phenomenal at his work. Oh Sherman, you are NEVER going to let me forget about Morton's are you? 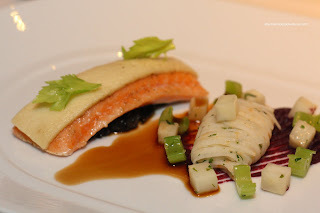 WRT Lumiere, it was one of the most memorable dining experiences for me. The food was outstanding and the service was impeccable. I’m glad I had the opportunity to dine there! flowerbunny, totally agree eh? What a meal! Victoria, I couldn't say many bad things about the meal because there was not much! WG... LOL... Glad you could join us!